NOW TAP HERE TO COMPLETE ENTRY!!! ELIGIBILITY: Sweepstakes is open only to legal residents of the United States (excluding residents of Puerto Rico and all U.S. territories and possessions) who are 21 years of age or older at the time of entry. The following are not eligible to enter the Sweepstakes: (i) employees of Joel Gott Wines (“Sponsor”) and its affiliated or subsidiary companies, including their officers, directors, shareholders, members, and employees, including employees’ immediate family members*; (ii) federal and/or state licensed alcohol beverage retailers, wholesalers and brokers, including their employees** and employees’ immediate family members*; (iii) Sponsor’s advertising agencies, including their employees and employees’ immediate family members*; (iv) members of any state alcohol beverage commission, including their employees and employees’ immediate family members*; (iv) any company involved with the design, production, execution or distribution of this promotion, [including their employees and employees’ immediate family members*]. *Immediate family members include spouses, parents, siblings, children, son-in-law, daughter-in-law, all lineal descendants, including those by adoption, or other household members. **Employees or immediate family members of parent companies that hold alcohol beverage licenses through a subsidiary company and exercise no control over the purchase, sale and/or distribution of alcoholic beverages are eligible to enter the Sweepstakes. Entries not meeting all of the requirements stated herein will be disqualified and ineligible. All federal, state and local rules and regulations apply. SWEEPSTAKES PERIOD: Sweepstakes begins on March 1, 2018 at 12:00 Noon Pacific Time (“PT”) and ends on May 31, 2018 at 12:00 Noon PT (the “Sweepstakes Period”), according to Sponsor’s time clock. HOW TO ENTER: Any time during the Sweepstakes Period, go to meetjoelgott.com and follow the online instructions. You will be asked to enter the required information outlined below. You may also text JOEL to 89800 to receive a single automated reply text message with more information on how to enter the Sweepstakes. You will not receive additional text messages, your text message is not an entry, and Sponsor does not retain your mobile number. Entrants will be required to provide an entry name, state of residence, phone number, email address and birth date. Standard data fees may apply. See your wireless carrier for pricing plan details. Check your wireless phone capabilities for specific instructions. One entry per natural person, per day. Should multiple users of the same e-mail account enter the Sweepstakes and a dispute thereafter arises regarding the identity of the entrant, the authorized subscriber of the e-mail account at the time of entry will be considered the entrant. Authorized account subscriber is defined as the natural person who is assigned an e-mail address by an internet access provider, on-line service provider or other organization which is responsible for assigning e-mail addresses or the domain associated with the submitted e-mail address. Any use of robotic, automatic, programmed or like means to enter the Sweepstakes will void all entries affected by such methods. Sponsor and its agencies are not responsible for unauthorized human intervention, phone, technical, network, electronic, computer, hardware or software failures, malfunctions or disconnects of any kind, or misdirected, illegible, incomplete, stolen, garbled, fragmented or delayed internet/e-mail computer/text transmissions or network/ISP/website internet accessibility; or for inaccurate, incorrect or incomplete capture of entry information. PRIZE: One (1) Grand Prize is available for this Sweepstakes. 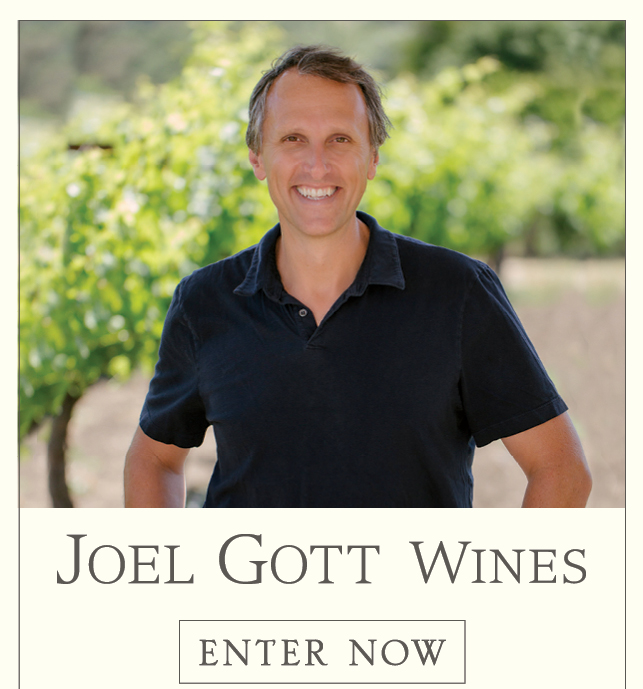 The Grand Prize is a trip for two (2) to meet Joel Gott in Napa Valley, California. The prize includes; round trip coach airfare for winner and one (1) guest (guest must be 21 years of age or older at the time of entry and meet all eligibility requirements in Section 1) from gateway city nearest the winner’s home to a major airport near Napa (as determined by Sponsors in their sole discretion), reimbursement for one rental car for ground transportation (up to $300.00), a seven hundred dollar ($700.00) Visa Gift Card for meals and incidental expenses (alcohol beverages excluded), double occupancy (one room) accommodations for a two night stay at a hotel selected by Sponsor. Trip must be taken WITHIN TWELVE (12) MONTHS OF THE END DATE OF SWEEPSTAKES PERIOD or the winner forfeits the prize in its entirety and Sponsor may award the prize to an alternate winner. Sponsor will determine airline and flight itinerary in its sole discretion. Travel and accommodations are subject to availability and blackout dates. Total Approximate Retail Value (“ARV”): $2,800. No alcoholic beverages are included in the prize. In the event a winner’s primary residence is within 100 miles enough to Napa Valley, California, such that air transportation is deemed by Sponsor in its sole discretion to be unnecessary, the prize package will not include air transportation, and Sponsor is not required to provide other substitution or compensation in lieu thereof, and the retail value of the prize will be reduced accordingly. Sponsor may in its discretion, but will not be obligated to award a gift card to winners who live within 100 miles. The winner and guest must travel together on the same itinerary and must possess all required travel documents. The rental car listed in the prize package description will be provided only if the winners or their guest qualify under the rental car provider’s term and conditions; otherwise, the rental car shall not be included in the prize package that is awarded and the winner shall receive no alternative transportation or further compensation in lieu thereof. WINNER SELECTION AND NOTIFICATION: The Grand Prize winner will be selected among all eligible entries received, in a random drawing on or about June 4, 2018. The drawing will be conducted by an independent judging Potential winner will be notified by e-mail using the information provided at the time of entry. No cash or other substitution may be made, except by the Sponsor, who reserves the right to substitute a prize in whole or in part with another prize of comparable or greater value if the intended prize is not available for any reason as determined by the Sponsor in its sole discretion. GENERAL: Potential winner and Guest will be required to sign a Declaration of Eligibility and Liability/Publicity Release and W-9 form and return it within ten (10) days of attempted delivery to qualify as the winner of a If there are insufficient entries or a potential winner forfeits a prize for any reason, the Sponsor may conduct an alternate drawing or choose to have the forfeited prize(s) remain unawarded. Winner consents to the use of their name, voice and/or likeness by the Sponsor for advertising purposes without additional compensation unless otherwise prohibited by law. Sponsor is not responsible for late, lost or misdirected mail or illegible information. All entries become the property of the Sponsor and will not be returned. Winner is responsible for all federal, state and local taxes not included above. By entering, participants and winner agree to be bound by the Official Rules. Sponsor retains the discretion to make all decisions regarding the interpretation and application of the Official Rules, including any ambiguities. All decisions of the Sponsor and the independent judging organization are final and discretionary. By participating in the Sweepstakes, participants and winner release Sponsor and its parents, partners, affiliates, subsidiaries, officers, shareholders, members, agents employees, advertising agencies and all others associated with the development and execution of the Sweepstakes from and against any and all liability with respect to or in any way arising from the Sweepstakes and/or use of the prize, including, without limitation, liability for personal injury, damage or loss. Sponsor will make commercially reasonable attempts to accommodate both winner’s schedule and the schedule of Joel Gott. There is no monetary value associated with meeting Joel Gott and winner and guest understand that this portion of the prize is based upon Mr. Gott’s availability. Winner and guest agree that meeting with Joel Gott may subject them to a criminal background check. GENERAL CONDITIONS: In the event that the operation, security, or administration of the Sweepstakes is impaired in any way for any reason, including, but not limited to fraud, virus, or other technical problem, the Sponsor may, in its sole discretion, either (a) suspend the Sweepstakes to address the impairment and then resume the Sweepstakes in a manner that best conforms to the spirit of these Official Rules or (b) terminate the Sweepstakes and, if terminated, at its discretion, select the potential winner in a random drawing from among all eligible, non-suspect entries received prior to action taken. The Sponsor reserves the right in its sole discretion to disqualify any individual it finds to be tampering with the entry process or the operation of the Sweepstakes or to be acting in violation of these Official Rules or in an unsportsmanlike or disruptive manner. Any attempt by any person to undermine the legitimate operation of the Sweepstakes may be a violation of criminal and civil law, and, should such an attempt be made, the Sponsor reserves the right to seek damages from any such person to the fullest extent permitted by law. Sponsor reserves the right at its sole discretion to terminate the Sweepstakes and, if terminated, at its discretion, select the potential winner(s) in a random drawing from among all eligible, non-suspect entries received prior to action taken. You may not enter with multiple identities or e-mail addresses or use any system, bot or other device or artifice to enter or obtain more than the maximum number of qualified entries. Failure by the Sponsor to enforce any provision of these Official Rules shall not constitute a waiver of that provision. Caution: Any attempt to deliberately damage or undermine the legitimate operation of the Sweepstakes may be in violation of criminal and civil laws and will result in disqualification from participation in the Sweepstakes. Should such an attempt be made, sponsor reserves the right to seek remedies and damages (including attorney fees) to the fullest extent of the law, including criminal prosecution. RELEASE AND LIMITATIONS OF LIABILITY: Sponsor shall not be liable to the winners for failure to supply any prize or any part thereof, by reason of any acts of God, any action(s), regulation(s), order(s) or request(s) by any governmental or quasi-governmental entity (whether or not the action(s), regulations(s), order(s) or request(s) prove(s) to be invalid), equipment failure, threatened terrorist acts, terrorist acts, air raid, blackout, act of public enemy, earthquake, war (declared or undeclared), fire, flood, epidemic, explosion, unusually severe weather, hurricane, embargo, labor dispute or strike (whether legal or illegal), labor or material shortage, transportation interruption of any kind, work slow-down, civil disturbance, insurrection, riot, or any other similar or dissimilar cause beyond any of the Sponsor’s control. By participating in the Sweepstakes, Entrants agree to release, discharge, indemnify and hold harmless the Sponsor, its parent, their respective subsidiaries or affiliate companies, and each such company’s officers, directors, employees, representatives and agents and all others associated with the development and execution of this Sweepstakes (the “Releasees”) from and against any claim or cause of action arising out of participation in the Sweepstakes or receipt or use of any prize, including, but not limited to: (a) any technical errors that may prevent an entrant from submitting an entry; (b) unauthorized human intervention in the Sweepstakes; (c) any printing, typographical, administrative or technological errors in any materials associated with the Sweepstakes; (d) errors in the administration of the Sweepstakes or the processing of entries; or (e) injury, death, or damage to persons or property which may be caused, directly or indirectly, in whole or in part, from entrant’s participation in the Sweepstakes or receipt of any prize. Entrant further agrees that in any cause of action, the Releasees’ liability will be limited to the cost of entering and participating in the Sweepstakes, and in no event shall the Releasees be liable for attorney’s fees. Entrant waives the right to claim any damages whatsoever, including, but not limited to, punitive, consequential, direct, or indirect damages. WINNERS LIST: To obtain the name of the winner, please send an email to [email protected] on or after July 15, 2018. © 2018 Joel Gott Wines. All rights reserved.